Century of Service is the story of Alberta's senior militia regiment. Although it was officially authorized in 1905, the South Alberta Light Horse can actually trace its origins back to early days of the Province in 1885 when units of irregular cavalry were raised in Western Canada during the Northwest Rebellion. The fascinating story of this proud regiment takes "Her Majesty's Cowboys" from the 1880s to the 21st Century. It describes how the predecessors of the modern Light Horse fought for their nation in times of war and struggled to stay alive in cheese-paring times of peace. The reader will accompany the Light Horse as they fight in the Rebellion of 1885, South Africa in 1899-1901, the Western Front in 1915-1918 and Northwest Europe in 1944-1945. Theirs is a chronicle of gallantry, sacrifice, patriotism and endurance (and not a little humour) during which they carve out a magnificent fighting record at the Somme in 1916, Vimy Ridge in 1917, the Normandy beaches in 1944, the Rhineland in 1945 -- and many places in between. Century of Service is also a history of the Province of Alberta from the time of aboriginal peoples to the modern day. As we follow the fortunes of Alberta's senior militia regiment, we also follow the fortunes of the province itself over a period of more than a century -- warriors and buffalo, cattle and cowboys, dust bowls and depressions, booms and busts. In doing so, we learn that many of the traits of the Light Horse -- independence, individuality, ruggedness, enthusiasm and self-reliance -- result from their Albertan background. Lavishly illustrated with more than 550 photographs, drawings, cartoons and paintings including fifteen pages of colour and specially-commissioned artwork, Century of Service will have interest for a broad audience. Appendices contain details of the Regiment's Battle Honours, awards and decorations, fatal casualties, commanding officers, predecessor units and a glossary of military terms, acronyms and abbreviations. Written in plain language for the general reader, Century of Service will appeal to those interested in the history of Canada and Alberta, military history, and the meaning of military duty. Details: Hardcover, 488 pages, 8.5 x 11 inches, More than 550 photos, illustrations and maps, Appendices, endnotes, bibliography, index, scale drawings of vehicles and weapons, organizational charts. "Century of Service, is not merely a stroy of military formations, maneuvers, machines and machinations. Rather it is a story of people, Alberta people, almost all of them, drawn from civilian life in a call to defend their homes in wars fought on foreign soil to prevent those wars from reaching their own soil. The SALH embraces in its ancestry 35 predecessor armoured, artillery and infantry units. Graves had to cover them all, yet somehow unite them into the unified story of the single modern regiment through which their history is being preserved. Plainly, this book could have become an incomprehensible hodge-podge of names, numbers, and unconnected anecdotes. What Graves has turned out is nothing of the sort. He masterfully weaves this confusion into a coherent and unified story which emerges as far more than a military account. It's the story of a province and a contribution it made to the preservation of a way of life many thousands of men felt were worth dying for." "This book] is accompanied by an extensive collection of phootographs, maps and diagrams, bringing the development of the regiment to life in the eyes of the reader. The numerous photographs, including many present day ones, are certainly among the highlights of Century of Service. 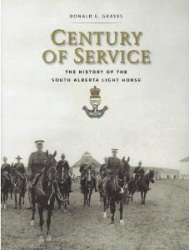 Century of Service; The History of the South Alberta Light Horse is a regimental history of which members can be proud. " "Donald Graves once again, has given tangible evidence that he is a master craftsman when dealing with military history. This book is written in the same lively style for which he has become known -- it really is a good read -- and here and there we find totally apt insertions of barrack room humour and reminders that peacetime soldiering (at least) is generally great fun. But underlying all this is meticulous research, serious study and a professional historian's insistence on evidence to justify his analyses. ...... this is an excellent book work, and it belongs on the shelf of everyone who has an interest in Canadian military history."